An unsettled couple of days with just a handful of noteworthy sightings. On 29th 4 smart Black-tailed Godwits dropped into Ancum loch and the Golden Plover flock grew once more to 139 birds. A surprise on 30th was the re-appearance after several days absence of the Golden Oriole with a couple of sightings in the Holland/Observatory area in the afternoon. The Pied Flycatcher continues to linger and a new Willow Warbler was caught in the Observatory traps while 2 hours of seawatching from the hide in the morning recorded 35 Storm Petrels and 14 Manx Shearwaters among the local species. A ringed Rosefinch at Gravity, Crossbill at the Observatory and Pied Flycatcher at Holland were the most notable (but all old) passerines seen on the 27th. Golden Plover numbers continue to pick up with 96 logged on both dates, while 52 Knot were present on the later. Also on 28th a Black-tailed Godwit was at Ancum and a Siskin came in at the north end during a sea-watch, while more expected sea-watch sightings included 2 Storm Petrels and 6 Manx Shearwaters. Another pleasant day with a few 'bits and bobs' scattered around.. A handful of new passerines were seen including a Crossbill which spent the day around the Observatory. A Greenfinch was at Holland House along with a Pied Flycatcher-the later probably a lingering bird whereas a Willow Warbler at Stromness Point was newly arrived. A Woodpigeon was on the west coast, an adult Common Tern in the Arctic Tern colony on Torness and a flock of 36 Curlew were seen to arrive from the south at the Observatory early in the day. After a few days of going missing, the long-staying Golden Oriole was seen again in the Holland area on both dates, with the Pectoral Sandpiper also still present at Trolla Vatn on the 24th. Also on the former date 71 Knot were at the north end and a Collared Dove at the south. Its nice to report some success among some of the breeding birds with the 155 Lapwings counted on 25th including many recently fledged juveniles. Black-headed Gulls have also had another reasonable year-67 fledglings were on the wing at Hooking today (with hopefully more to follow) while the first 2 Common Gulls to follow suit were at Gretchen. 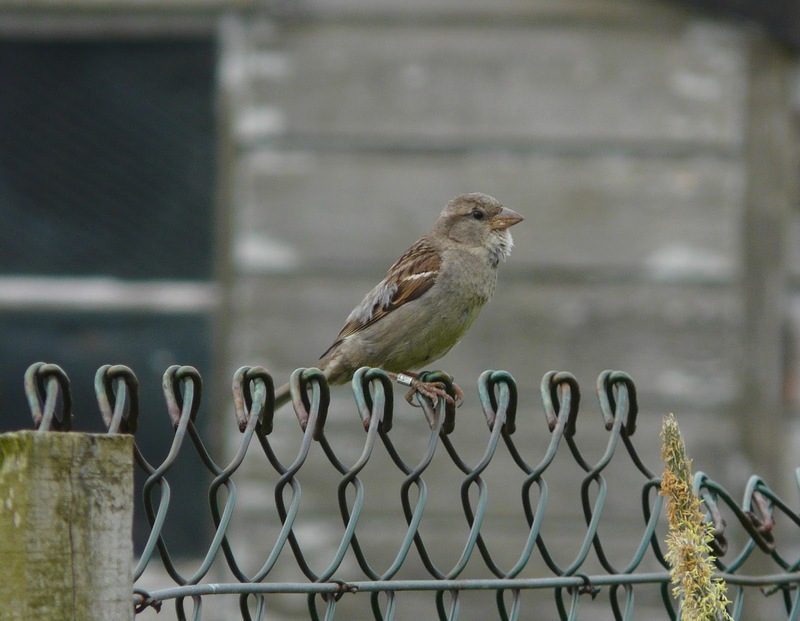 Apologies to 'Friends of NRBO' as we have not yet been able to supply you with our 2nd annual bird report. Its been a frustrating couple of months of production with multipe printer problems since March, beginnning with the break down of the original machine on just the second copy! We have only managed to resolve these issues in the last week after several replacement printers arrived either faulty or damaged during delivery, but (touch wood) our fourth machine is currently working well and fingers crossed the report should be arriving on your doorstep in early July. We thank all 'Freinds' for their patience and continued support. The birds keep on coming, with the moderate easterly wind, cloud and a few rain showers on 22nd producing more new arrivals. 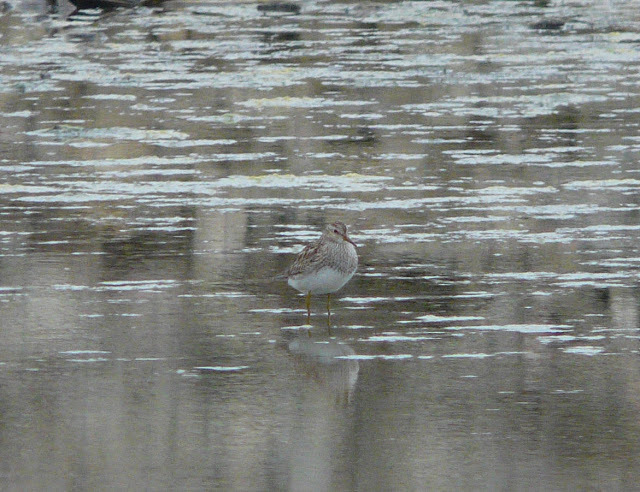 The highlights were our 3rd Pectoral Sandpiper of the spring which showed well on the scrape at Trolla Vatn and yet another Red-backed Shrike-this time a rather soggy looking male near Garso. The 2 Rosefinches remain at Holland House, where there were also single Pied and Spotted Flycatchers, the singing Lesser Whitethroat and Common Redpoll. 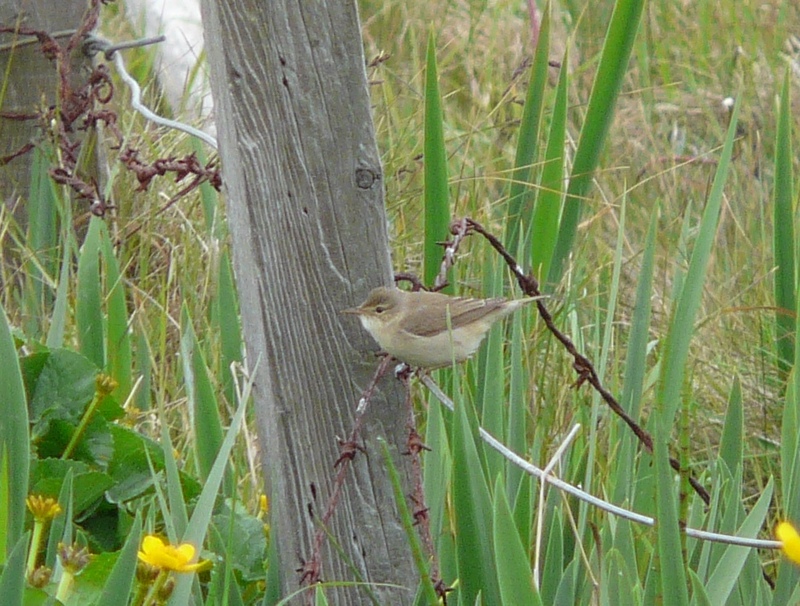 2 WillowWarblers (at Hooking and Rue) were new while 63 Knot were spread around the lochs at the north end. The 23rd was a much wetter day, with the mist also frequently dropping in. All of the previous days highlights were still with us, with a new (un-ringed) Rosefinch at Ancum Willows while one of the old birds was seen again at Holland. 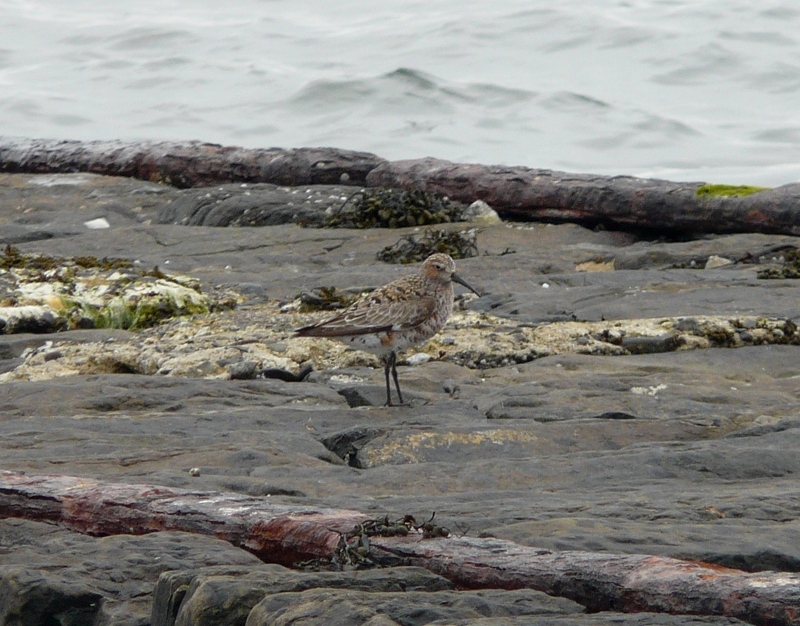 The only other birds of note were a Spotted Flycatcher at the Pier and 38 Golden Plovers in fields near the old Kirk. Another warm day, with a decent selection of birds still around. Most of the birds were again at Holland House where the highlights were a Golden Oriole again and 2 Rosefinches-both trapped and ringed in the evening. A Song Thrush, Pied Flycatcher and Common Redpoll were new arrivals there while the Turtle Dove, Reed Warbler and Lesser Whitethroat were still present. A Spotted Flycatcher was near Gravity and 4 Swifts were over the Observatory late in the day. 3 Pintails on Hooking Loch were the best of the rest and there are now 20 fledged Black-headed Gull chicks in that area. In sunshine and with a warm southerly wind, today turned out to be surprisingly eventful on the bird front. It began in the morning with a trio of singing Warblers, headlined by a Marsh Warbler offering a full range of mimicry at Newbiggin, with new Lesser Whitethroat and Chiffchaff offering support at Holland House. Also at Holland early on was a Turtle Dove (later trapped and ringed) in the company of 4 Collared Doves, with our first Crossbill of the year, a male there at lunchtime. 9 Swifts over the west side, 4 Knots and 18 Golden Plovers were the highlights from the days census meanwhile back at Holland in the evening a worn 'brown' Rosefinch was soon found, followed by the remarkable finale of 2 Golden Orioles dropping into the gardens together-the first time more than one has been present in the Islands history! Another rubbish Oriole picture-but this shows the first time 2 birds have been present together on the Island! This years Golden Oriole saga has been complicated to work out-The bird on the right is ringed, and trapped again tonight we discovered it was actually the bird first seen on 10th and ringed on 12th. We thought it had left on 14th, but we now know it was still present (but not definitely seen) on 16th-on the same day as our second of the spring was found in a mist net. This second bird was assumed to have been the bird we have seen daily since then but we now know that was incorrect-it was presumably just present the day it was trapped and ringed with the original bird actually accounting for daily sightings since the 16th! 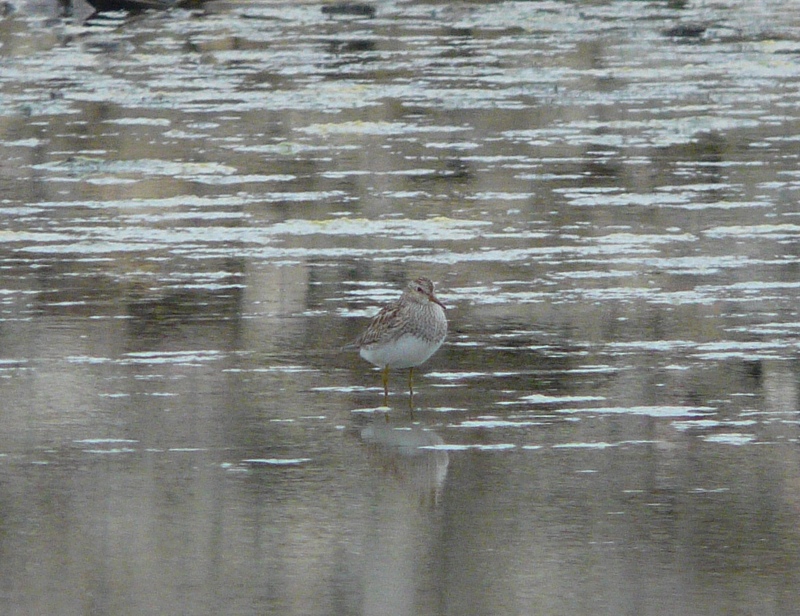 The other bird seen/photographed today is considered to be the third individual of the spring! A fairly wet 18th prompted a sea-watch off the north end in the morning, with another 2 Storm Petrels and a Manx Shearwater seen in an hour. 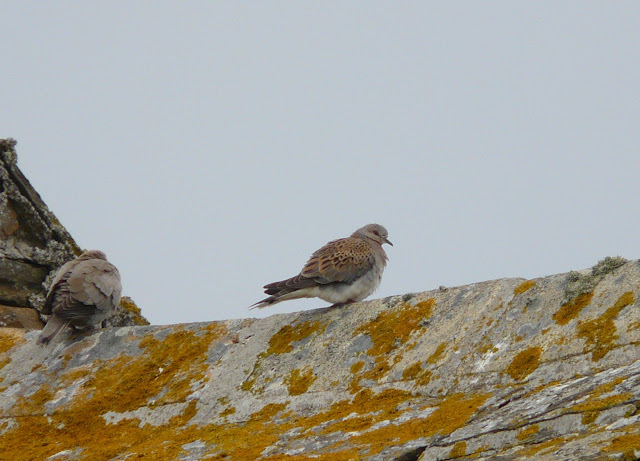 A couple of Collared Doves were new, while the Golden Oriole remained typically elusive in Holland House. It was still there on 19th joined again by the Nightjar which was inadvertently disturbed from its roost a couple of times during the day. A Peregrine was also seen, along with 5 Swifts and the first indications of returning Golden Plover passage were detected with a flock of 19 present. Arctic Terns have settled down to breed in the last few weeks-fingers crossed! A rare windless day, with plenty of cloud. A male Nightjar in the gardens at Holland House was presumed to be the bird from the 14th-although we had similar thoughts about the Oriole until we trapped two, and with a few other new migrants around in recent days it could be new? 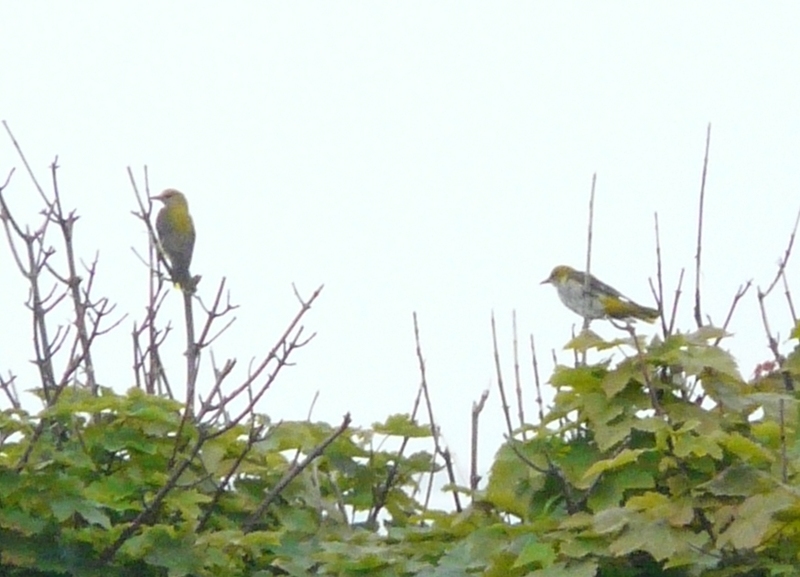 The/a Golden Oriole was also present there all-day, along with the Reed Warbler. The only definite new arrivals were a Short-eared Owl and a Whitethroat at the Observatory. Another foggy morning gave way to a glorious afternoon again. As usual for this time of year most of the new passerines were to be found in the gardens at Holland House with the remarkable highlight being another Golden Oriole caught and ringed there early in the morning. This bird had presumably just arrived (with the original one thought to have been responsibly for sightings up to the 14th) as it weighed a full 20 grams less than the individual which lingered for a few days before it was caught on 12th. Other birds at Holland included a Reed Warbler, and bizarrely a Greenfinch, while 2 Spotted Flycatchers and a White Wagtail were also present on the Island. The Red-backed Shrike remains at Ancum, as does the Curlew Sandpiper and 30 Knot at Bewan. The second Golden Oriole was a very similar looking individual to the first bird trapped several days ago with exactly the same wing length but it had two retained secondaries while the original bird had four. The magic combination of easterlies and rain just produced a Cuckoo which flew around the island being attacked by everything that saw it and a Spotted Flycatcher trapped at Holland House; also seen was the male Red-backed Shrike still near Ancum and the Curlew Sandpiper which had moved up to Bewan where there were also 54 Knot around the loch. A little look from the seawatch hide at the north end in the afternoon produced 6 Manx Shearwaters and the first Storm Petrel of the year. A windy start gave way to a lovely day with a few highlights dotted around the island - pride of place going to a very showy Nightjar roosting out in the open on a plank of wood in Upper Linnay garden for most of the morning; other quality birds included two Red-backed Shrikes with a female at Westbeach and a male at Ancum and the Golden Oriole giving typically brief views as it bombed around Holland House. The best of the rest comprised a female Hen Harrier which flew south, a Curlew Sandpiper on Gretchen, three Whimbrel, the Wood Sandpiper again on Hooking, 12 House Martins, a Spotted Flycatcher and a trickle of 85 Kittiwakes flying down the west coast. The days highlights all came from Holland House in the morning with the Golden Oriole seen briefly as it was flushed out of the Sycamores, a Common Rosefinch which dropped in for a couple of minutes before flying off north and a male Red-backed Shrike which eventually moved off down the road towards the Obs. Other birds seen included a few hirundines with a some new Swallows noted with 10 House Martins, 30 Bar-tailed Godwits, three Barnacle Geese over to the south and presumably the same Wood Sandpiper which had moved up to Westness. The wide variety of weather we experienced through the day (heavy rain merging into thick fog, followed by rain and thick fog together before a bright, pleasant late afternoon gave us hope until thick fog rolled in again!) produced a nice variety of birds with the Golden Oriole of two days ago reappearing in a mist net at Holland House, a female Red-backed Shrike also at Holland and a smart male Black Redstart at Bewan the highlights. Other birds of note included 45 Knot, a Whimbrel, 23 Bar-tailed Godwits and the Wood Sandpiper again. The wind being still in the east produced an unusual selection of birds; a Hobby which zoomed north over Holland in the morning and a male Red-backed Shrike at Ancum along with two Spotted Flycatchers and a Garden Warbler were typical for the time of year however, not typical was a Fieldfare near the Obs and a drake Goldeneye which flew past Westness! A few waders continue to pass through with a turnover of Bar-tailed Godwits and Knot noted. Late News! - A stunning male Bluethroat was caught in one of the Obs Helgoland traps at around 9.30pm. Three Spotted Flycatchers were caught at Holland first thing which gave hope for the rest of the day but it unfortunately largely failed to materialise; another Spotted Flycatcher on the west coast and a Merlin being the highlights, that is however until late afternoon when a smart female/immature Golden Oriole was flushed out of Holland gardens to be seen a couple more times before disappearing shortly afterwards. The Wood Sandpiper was still around Hooking and 15 Bar-tailed Godwits passed through. Smart bird-rubbish photo! Just the 9th Golden Oriole to have been recorded on North Ronaldsay. With the wind having switched round to the east there was a sprinkling of late spring migrants across the island today including a Marsh Warbler at Westness, a Spotted Flycatcher and a couple of new Chiffchaffs. Waders were also in evidence with a Wood Sandpiper on Hooking the pick along with 35 Knot and 27 Bar-tailed Godwits but also noticeable were a few small flocks of commoner species starting to appear including 25 Curlew, 20 Lapwings and 15 Redshank in addition to the breeding birds - presumably failed breeders grouping together already. What was presumably yesterday's female Red-backed Shrike was seen briefly at Holland House in the morning; other migrants today included a Swift, a Merlin, 20 more Bar-tailed Godwits which passed through and new Garden Warbler and Lesser Whitethroat. Also of note was a notable influx of Arctic Terns with at least 600 on the island today, with the larger numbers seen at sites where they have bred in the past - including 350 in Nouster Bay, hopefully this increase in numbers will encourage them to start to settle down to breed. A nice female Red-backed Shrike was caught at Holland House first thing, where there was also Garden Warbler and Blackcap while Lesser Whitethroat and Chiffchaff were still singing away. Otherwise it was pretty quiet with 23 Bar-tailed Godwits seen heading north in small flocks and more atypically, c30 Kittiwakes floating down the west coast and roosting on the coast - unfortunately perhaps representing failed breeders moving around already. Our focus now has shifted to the breeding birds with coordinated searches revealing good numbers of Oystercatcher and Lapwing chicks running around while the Black-headed Gull chicks are growing well. An hour-and-a-half seawatch in the morning from the north end produced the brilliant highlight of a group of 3 Orca which went south down the west coast mid-morning which included a huge male, always fantastic when they appear! There were a few birds seen as well at sea including 6 Manx Shearwaters, 265 Gannets, 70 Puffins and a flock of 14 Common Scoter. The days other notable birds all consisted of waders around the top end indicating there is still a regular turnover of birds passing through the island as numbers today included 2 Little Stints, 2 Curlew Sandpipers, 2 Bar-tailed Godwits and 58 Knot with the larger numbers of Turnstone, Dunlin, Sanderling and Ringed Plover. Another beautiful but quiet day; the pair of Blue-headed Wagtails were again on Ancum - they must at least be thinking about settling down now and a group of 51 Bar-tailed Godwits arrived in Nouster Bay in the afternoon but only stayed a short time before moving on while both Lesser Whitethroat and Chiffchaff were singing away in Holland House gardens. Firstly, late news from yesterday as an Osprey flew south down the island, over the Obs and out towards Sanday just after 10pm; as for today thick fog shrouded the island for much of the day limiting observations to a (relatively) clear window of a few hours around the middle of the day when birds of note included a Pectoral Sandpiper which [re]appeared on Ancum Loch (probably one of the two birds last seen on 31st May but with a regular turnover of waders on the island still, it could be a new bird? ), male and female Blue-headed Wagtails also still at Ancum, the two Curlew Sandpipers still and an good count of 75 Bar-tailed Godwits - including a flock of 70 at Westness which, like all the planes through the day were grounded in the fog. Most of the new birds were around Holland House in the morning with new Lesser Whitethroat, Garden Warbler, Chiffchaff and Blackcap (2) ringed while three Collared Doves were also seen and the two Curlew Sandpipers were still on Gretchen. A series of text messages in the evening reporting a Pallid Harrier leaving Fair Isle to the south had us running around like loons trying to predict when and where it would it arrive but unfortunately we had no luck although a Short-eared Owl, three House Martins and a nice flock of 40 Knot were found. Interesting news concerning some colour ringed Sanderling was also received today with one red-flagged bird seen at Brides yesterday originally ringed in Ghana and another bird seen in early May being re-sighted in Iceland just 4 days later! Fantastic stuff, thanks to Orkney Ringing Group for the information. A beautiful but quiet day with little to shout about; there were new Garden Warblers and Lesser Whitethroats seen while the two Curlew Sandpipers on Gretchen and the male Blue-headed Wagtail on Ancum remain. Also noteworthy; after a report from an islander a late night excursion confirmed a singing Spotted Crake from an area of Iris near Hooking which has been heard for the last few nights - the first singing bird on the island in around ten years! A fine male Red-backed Shrike was trapped at Holland House first thing with other new birds through this glorious day - bright sunshine and light winds, including a female Hen Harrier, a female Sparrowhawk, 4 Woodpigeons, two Jackdaws and a Short-eared Owl. There was also a good selection of lingering birds making it into June with the male Blue-headed Wagtail, four Common Scoter, two Curlew Sandpipers, 8 Great-northern Divers and 6 Snow Buntings still present. 11 Sedge Warblers were counted across the island mainly involving breeding birds while a Lesser Whitethroat was also singing from Holland House.